WorldViz, provider of virtual reality solutions for the enterprise and public sectors, is launching a new VR communication platform for businesses. Based on their popular Vizard software, it enables complex visual ideas to be assessed remotely, through VR presentations and virtual meetings. Virtual Reality is considered by many to be the ‘final compute platform’, and a key promise of our VR-enriched future is communication. The ability to socially engage and interact within a shared virtual environment, particularly when the participants are spread across the world, is a complex hardware and software challenge, and WorldViz is on the forefront of this area of development. Today, WorldViz revealed their new VR communication platform, codenamed ‘Skofield’, aimed at businesses looking for new, immersive ways to collaborate on complex projects and ideas. Currently on show at Autodesk University event this week, it is pitched as the VR equivalent of GoToMeeting, the popular video conferencing and desktop-sharing solution used by businesses across the world. Video conferencing is an invaluable tool, but until now there has been no substitute for being physically present with your team, particularly when assessing complex objects, environments, schematics, and the like. Skofield uses VR’s inherent ability to provide user ‘presence’ within a virtual environment to bring people together in a natural way, dramatically reducing the need to physically travel in order to assess visual content. If you recall last month’s predictions of the next five years of VR by Oculus Chief Scientist Michael Abrash, you’ll note that his idea of the ideal VR workspace sounds quite similar. Built on WorldViz’s device-agnostic rapid-prototyping development software, Vizard, which includes a physics engine that supports rigid body dynamics, vehicle and robot simulation, Skofield promises to be a powerful creation and presentation tool. It incorporates a what-you-see-is-what-you-get editor within its ‘Presentation Designer’ software, allowing the creator to quickly drag and drop elements into a VR presentation, setting proximity triggers, defining which objects have interactivity, inserting PDFs or PPTs within the scene to work as training manuals or fact sheets. Once created, the presenter can then invite attendees of the virtual meeting to join a session immediately or at a later date via email or text. 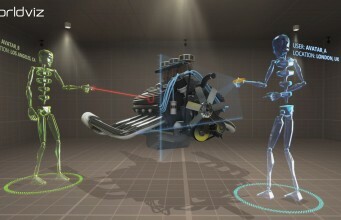 Moving about in the space, using a virtual laser pointer, zooming in on objects, annotating and measuring them will all be possible through the included tools. Skofield also provides telephony for voice as well as gaze tracking, and can record meetings for later reference. Such a platform could be revolutionary for complex industries such as aerospace and construction, particularly if hazardous environments are involved. Thanks to Vizard’s built-in ‘VizConnect’ feature, Skofield will support many VR hardware systems, including the Oculus Rift and HTC Vive, 3D displays, CAVE projection systems, input devices, and all the mobile devices WorldViz already supports. Other headsets will be added over time depending on demand. Pricing has yet to be announced, but beta testing starts today and any interested company can sign up to give give Skofield a try. The post WorldViz is Creating a VR Platform for Enterprise Collaboration appeared first on Road to VR.